Marwan knows he is one of the lucky ones. For four years, he, his wife, Rodina, and their three daughters, watched as war ripped Syria apart. For four years, the family did not openly celebrate Easter or Christmas. As Christians, Marwan knew they were living their lives with targets on their heads. He remembers a time when religion didn’t matter. There were no differences between us, he says. Now, the Syria he once knew is unrecognizable. “[ISIS was] always treating us badly, especially us as Christians, because we were unbelievers. First, they wanted us to be Muslims like them, and second they wanted us to pay—money or kill,” he says, referring to the jizya—a non-Muslim “tax” ISIS has been forcing Christians to pay in Syria in return for protection. When the bombs began exploding near the offices where he worked as a civil engineer on the outskirts of the city, the family knew it was time to leave. They fled Syria and traveled to Ireland in April 2015. But while escaping war may seem like an ending, it is really a beginning—with the dream of rebuilding a normal life hampered by the bureaucratic roadblocks that appear at almost every turn. Unlike so many fleeing Syria today, the family had a lifeline in Europe, a cousin who had been living in Ireland for ten years. It was a tight squeeze, but Marwan’s family of five joined his cousin’s family of seven and the 12 managed that way for a month. It wasn’t easy, but it was safe. The family then moved to a “direct provision” center in County Mayo in the West of Ireland. 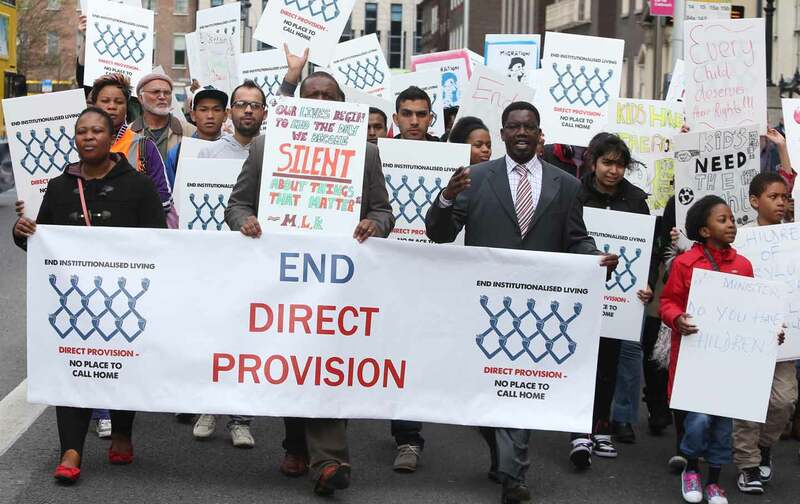 Direct provision—a controversial method of dealing with asylum seekers in Ireland—has been branded “inhuman” and “degrading” by NGOs and migrant-support organizations. The system sees asylum seekers languishing in prison-like centers—often for years—before a decision is reached on their application. Food is provided at set mealtimes, leaving residents feeling institutionalized and without agency or autonomy. Depression rates are up to five times higher in the centers than in the rest of Ireland. Critics of the system note that nothing about it mimics a natural living environment and advocates have expressed concerns for the well-being of children in particular. There are roughly 4,811 people currently in the system, one-quarter of them children. The average wait time is three years and eight months. Marwan’s family were lucky enough to spend only four months in one of the centers before receiving their refugee status and the right to work in September. “After that, we were suffering to find a house, because the landlords didn’t take rent allowance,” he says, referring to a supplement provided by the state to families who can’t afford to pay the full cost of their accommodation. In a stroke of luck unimaginable to thousands like them across Europe, the family were taken in by a couple in Dublin while they searched for their own home. Even when the local parish pledged to cover their housing and education costs for two years and The Irish Times took an interest in their story, still landlords were reluctant to rent to the family. But in late February, after months of disappointment, they got what they had been praying for. They signed a lease on a house only five minutes from the children’s new school. The community had grown to know Marwan and pulled together to make sure the family could find a home in the area. He is immensely grateful, but he is also angry about the war in his homeland. The family speak to their relatives who stayed in Syria any time they can, but with electricity so expensive and unreliable, it’s not always possible. From Marwan’s perspective, Russia has been Syria’s “real” partner. “[Russia] pushed the United States to find a solution to our war—and now they are both working together. The USA is now trying to push the other groups, the opposition groups,” he says. This is a view common in the government strongholds, but not all Syrians have regarded Russian airpower as an ally and numerous human-rights organisations have accused Russia of killing hundreds of civilians in opposition areas through its bombing campaign. At the same time, the United States has trained and funded groups of “moderate” rebels that are now hellishly interlinked with the Nusra Front, Al Qaeda’s Syria affiliate. “This is not a civil war as is written in the media—no, this is not civilian war,” he says, referring to the number of foreign fighters in Syria and the many countries that “want to get their hands on” the country. He is hopeful that the new cease-fire will be a success, but doubts remain. Opposition groups, he says, are “interlaced with the Daesh terrorists and Nusra.” It won’t be easy, he argues, for the United States to extract them. He is adamant that the extremists fighting in his country in the name of Islam are not Muslim, despite the fact that they identify as such. Growing up, his father told him to learn as much as he could about the major religions that dominated the secular country. ISIS militants, he says, bear no resemblance to the Muslims he called friends and neighbors. “[ISIS members] do not know anything about the Koran—no, no. This is the truth. I have studied the Koran for maybe ten years. My father told us to study everything, study the origins—the Koran, the Bible—try to know everything,” he explains. He knows compared to this, he is fortunate: “I am much more lucky, because I found very good people, very kind people, very sympathizing people, very understanding people—and now if I wanted to choose any country in the world, I would choose Ireland,” he says. What Marwan and his family have experienced in Ireland is a world away from the experiences of thousands of others in similar situations all over Europe. Partly, that is due to their religion. While they faced difficulties in Ireland, as Christians they were welcomed more readily. But religion aside, it is impossible to fairly compare the reception one family in Ireland has received from a local community to the stories of open hostility and violence becoming more and more common in Germany and France. For a start, the numbers are incomparable. While it may be relatively easy for a small community in Dublin to integrate one or two families out of the 4,000 refugees the Irish state has pledged to take in, the dynamics and logistics are different in Germany, where anti-refugee sentiment has grown over Chancellor Angela Merkel’s much-criticized “open door” policy, which saw more than 1 million migrants and refugees arriving in the country last year alone. As might be expected, smaller numbers of refugees do not provoke the same reactions in society as larger numbers—particularly when many of those arriving in countries like Germany and France come without proper identification or use fake Syrian IDs in the hopes that they will be processed more quickly. But even in Ireland, where the housing, processing and integration of a small number of asylum seekers and refugees should, technically, be far less complicated, it was still the willingness of a local community to step up that set Marwan’s experience apart. He knows that without the parish’s help, his family’s experience could have been very different. Marwan requested that the family’s surname not be published in order to protect the identity of family members still living in Syria.